Tests and their answer keys for all four seasons/sections of the book, AND the student study guide is also included. -The tests heavily cover literary devices and figurative language, plus: inferencing, cause and effect, and characterization. The forth test for "Winter" is a summative assessment that covers: literary devices and story elements. - The test are formatted with: matching, multiple choice, short answer, one bonus per test over the designated "independent reading chapters" and one longer essay (on the summative). -On all of the tests, the short answer section is differentiated with: student choice (i.e. the students choose which 3 out of 6 questions they will answer) and sentence stems for answering the short answer questions. 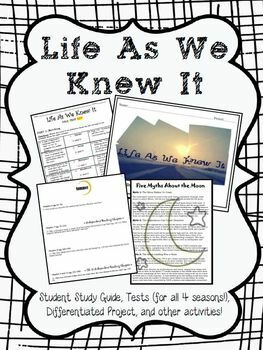 -This study guide has everything you need to get started with the novel, Life As We Knew It. The booklet includes: a table of contents (including spaces for students to track test scores for each section of the book). - Discussion questions for each chapter. *Upload the 15 page preview file!